Early summer approached, but none of the happy, carefree days of summer's past. There was a dense fog all around me and I couldn't seem to find my way out. My heart felt shattered in a million pieces and hope was quickly escaping through the open wounds. As I got ready for church nothing was helping, not worship music, scripture or encouragement. Knowing I would be in North Carolina I had planned to visit Elevation Church, I have loved listening to their sermons online, so there should have been anticipation, at least a little excitement, but there was none to be found. The Elevation Church experience starts in the parking lot. I pulled up to the school, followed signs and hand motions to the visitor’s parking area, got out of my car and averted my eyes. At any moment the dam that restrained my tears could burst. I made my way inside without a single tear falling and was hopeful I could get a seat unnoticed. The doors opened and they ushered me onto the second row. Worship started and the lights dimmed, so I let the tears fall. They fell hard, fast and steady. I needed this release. The Lord spoke gently to me, “It’s not what you see, it’s what you focus on.” My heart steadied and I could feel hope rise. “That’s faith,” I thought to myself. Jonathan Josephs, campus pastor, was preaching and he said, “I believe that I am on assignment today to release a word from God that will catapult someone into their God-given destiny and purpose.” “My sermon title for today is this ‘Stay Focused’,” he added. Moses had asked them for specifics when exploring the land (Numbers 13:17-20), specifics that God had never asked them to look for. When they came back that is exactly what they reported and what they were focused on. Their fear was increasing about what they saw by what they were saying. No matter what is coming at us from ourselves or others we must cling to what God has said and speak it out of our mouths. 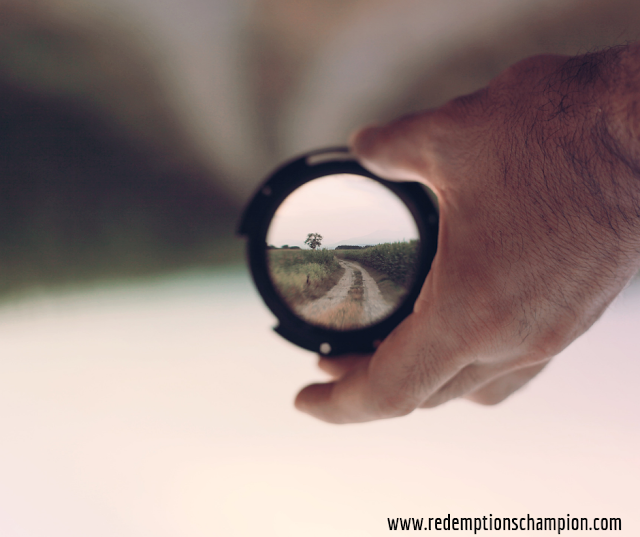 In one sermon's time everything came into focus - my gaze on Him, I heard His still small voice and my mouth was ready to proclaim His promises. Historically, circumstances have shaken me, thrown me for a loop and literally derailed me, but not today. Today I focused, maybe for the first time, not on what was happening around me, but Who was happening inside me. He spoke, I responded and everything came into focus. Ann Voskamp says, "When the heart and mind focus on things unseen - that's when there's a visible change in us." That was my experience that day, glory to God!